The Air Force Association organized support for the memorial on behalf of its membership and Air Force veterans. On 28 December 2001, President George W. Bush signed the Defense Authorization Bill, which included a rider directing the Department of Defense to make available to the Air Force Memorial Foundation up to 3 acres of the Naval Annex property for use as the location for the memorial. Formal groundbreaking of the site was held in September 2004. Construction of the spires began in February 2006 and was completed in 7 months. The memorial was dedicated on 14 October 2006, with approximately 30,000 people attending. The keynote address was delivered by President Bush, a former F-102 Delta Dagger pilot with the Texas Air National Guard. The first official ceremony at the memorial was held the next day when Secretary of the Air Force Michael Wynne laid a memorial wreath beneath the spires for fallen airmen. 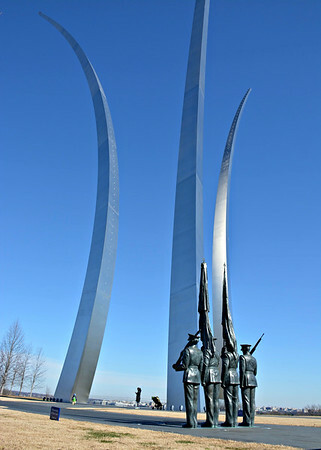 In April 2017, the day-to-day operations of the Air Force Memorial were transferred to the Air Force District of Washington. The Air Force Memorial Foundation, the organization created to plan for and build the Memorial, continues today as an affiliate of the Air Force Association.